Click to listen to episode (4:20). Unless otherwise noted, all Web addresses mentioned were functional as of 1-11-19. From the Cumberland Gap to the Atlantic Ocean, this is Virginia Water Radio for the week of January 14, 2019. This week, we feature a sound-and-music medley for a weather-and-water mystery. Have a listen for about 25 seconds, and see if you know what kind of weather record was broken in 2018 in several locations in Virginia. If you guessed precipitation or rainfall, you’re right! You heard a Blacksburg, Va., thunderstorm, along with part of “Rain in the Valley” by The Steel Wheels, from Rockingham County, Va. In 2018, annual local records for total precipitation—that is, rainfall plus the water equivalent of frozen precipitation—were broken in five National Weather Service observation locations in Virginia: Danville, Lynchburg, Roanoke, Reagan National Airport in Arlington County, and Dulles Airport in Loudoun County. And Richmond’s Weather Service observation location experienced the second-highest annual precipitation on record. Records at those locations go back to the early 1900s or late 1800s, except for the Dulles Airport location, where records go back to 1960. Those six locations had over 60 inches of precipitation in 2018, compared to normal annual values of around 40 to 45 inches for most locations in Virginia. At six other Weather Service observation locations covering parts of the Commonwealth, precipitation in 2018 didn’t break records but still ranged from about seven inches above normal at Wallops Island in Accomack County to nearly 20 inches above normal at the Charlottesville-Albemarle County Airport. Beyond Virginia, across the eastern and Midwestern United States, annual precipitation records were broken in nearly 200 locations in 2018, according to Ian Livingston of The Washington Post’s Capital Weather Gang. Besides official National Weather Service observation locations, Virginia has over 1000 weather-observation stations participating in the Community Collaborative Rain, Hail, and Snow Network of volunteer weather observers. 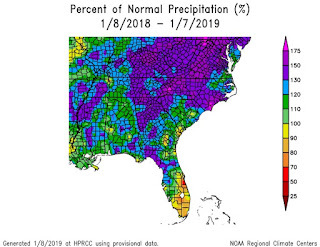 If you live in the Commonwealth, a station near you may also have seen record precipitation in rainy 2018. Thanks to The Steel Wheels for permission to use this week’s music. We close about a bit more music for precipitation; here’s part of “Rain Refrain,” composed and performed for Virginia Water Radio by Torrin Hallett, a 2018 graduate of Oberlin College and Conservatory in Oberlin, Ohio. “Rain in the Valley,” from the 2012 album, “Lay Down, Lay Low,” is copyright by The Steel Wheels, used with permission. More information about The Steel Wheels is available online at http://www.thesteelwheels.com/. This music was also featured in Virginia Water Radio Episode 328, 8-8-16, on flash flooding. Percent of normal precipitation for the Southeastern U.S. climate region and for the continental United States for the past year, as of January 7, 2019. Maps taken from the High Plains Regional Climate Center in Lincoln, Nebraska, online at https://hprcc.unl.edu/maps.php?map=ACISClimateMaps. Wakefield, Va., online at https://w2.weather.gov/climate/index.php?wfo=akq. Jason Samenow and Ian Livingston, Drenched city: 2018 is now Washington’s wettest year ever recorded, Washington Post, 12/15/18. 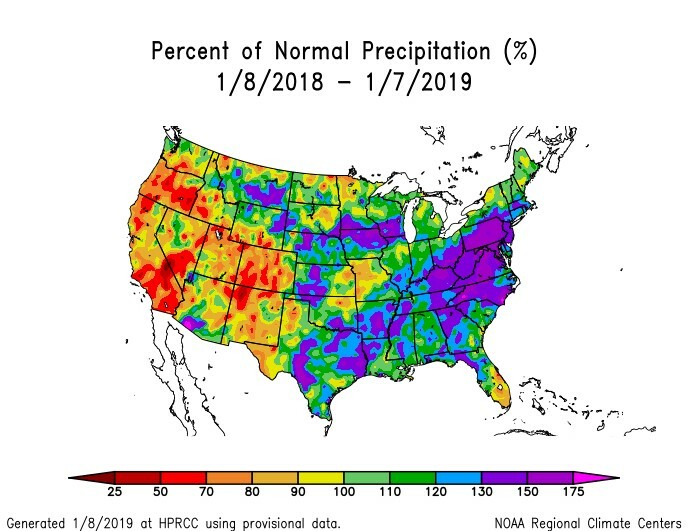 According to the NWS, as of January 2019 precipitation values from 2018 are still preliminary; that is, they haven’t undergone final quality control by the National Climatic Data Center (NCDC) and therefore are subject to revision. Final, certified climate data are available from the NCDC online at http://www.ncdc.noaa.gov.” Normal values currently used by the NWS are based on the period from 1981 to 2010. The NCDC released these normal values in July 2011. For information on the normal values, see the NCDC Web page at http://www.ncdc.noaa.gov/data-access/land-based-station-data/land-based-datasets/climate-normals. R = record monthly high for the given month, or annual high, for the given location. *NWS reported nine days of data missing at Danville in January 2018, so Danville total is possibly greater than shown. 1 - The Bluefield location is the Mercer County, W. Va., airport, near the Va.-W.Va. state line. 2- The Bristol location Tri-Cities Airport in Tenn., about 20 miles from Bristol, Va./Tenn. 3 - The Charlottesville location is the Charlottesville-Albemarle Airport. 4 - Reagan National Airport is in Arlington County. 5 - Wallops Island is in Accomack County. 6 - Washington-Dulles Airport is in Loudoun County. Blacksburg – 57.63 in 1972 (records since 1952). Bluefield – 54.58 in 2004 (records since 1909). Bristol – 65.64 in 2003 (records since 1937). Charlottesville – information not found. Danville – 67.43 in 2018 (previous was 60.03 in 1996; records since 1916). Lynchburg – 65.70 in 2018 (previous was 59.71 in 1972; records since 1893). Norfolk – 70.72 in 1889 (records since 1871). Richmond – 72.02 in 1889 (records since 1872). Roanoke – 62.45 in 2018 (previous was 57.84 in 1948; records since 1912). Wallops Island – information not found. Washington, D.C. (now measured at Reagan National Airport in Arlington County, Va.) – 66.28 in 2018 (previous record was 61.33 in 1889; records for Washington since 1871, according to The Washington Post). Washington-Dulles Airport – 66.75 in 2018 (previous was 65.67 in 2003) (records since 1960). Community Collaborative Rain, Hail, and Snow Network (CoCoRaHaS), “Virginia Daily Precipitation Reports,” online at http://www.cocorahs.org/state.aspx?state=va. “Stations in Virginia,” at https://www.cocorahs.org/Stations/ListStations.aspx, lists over 1103 records, as of January 14, 2019. Ian Livingston, Dozens of sites in the Mid-Atlantic and Midwest have already logged their wettest year on record, Washington Post, 11/28/18. Kevin Myatt, Roanoke annual rainfall record is official, Roanoke Times, 12/16/18. *Wakefield, Va., online at https://w2.weather.gov/climate/index.php?wfo=akq, for Norfolk, Richmond, and Wallops Island in Accomack County. National Weather Service, “Snow Water Equivalent and Depth Information,” online at https://www.weather.gov/marfc/Snow. Madeleine Simon and Alejandro Alvarez, It’s Official: 2018 is DC’s Wettest Year on Record, WTOP FM-Washington, D.C, 12/15/18. U.S. Climate Data, “Climate Virginia,” online at https://www.usclimatedata.com/climate/virginia/united-states/3216. High Plains Regional Climate Center at https://hprcc.unl.edu/maps.php?map=ACISClimateMaps). This site provides maps of total precipitation and percent of normal precipitation for the past 7, 30, 60, or 90 days for all U.S. regions. Virginia is in the Southeast region. National Weather Service/Advanced Hydrologic Prediction Service, online at http://water.weather.gov/precip/, providing maps of precipitation nationwide or by state, with capability to show county boundaries, and archives available for specific days, months, or years. National Weather Service/Storm Prediction Center, online at http://www.spc.noaa.gov/climo/online/, providing daily maps and text for preliminary reports of severe thunderstorms, tornadoes, and hail. National Weather Service/Hydrometeorological Design Studies Center, “NOAA Atlas 14 Point Precipitation Frequency Estimates: Va.,” online at http://hdsc.nws.noaa.gov/hdsc/pfds/pfds_map_cont.html?bkmrk=va. Following are links to other episodes rainfall, flooding, or stormwater. Episode 192, 12/16/13 – Rain, Romance, and the Rockfish River in “Blue Ridge Girl” by Chamomile and Whiskey. Episode 272, 6/29/15 – Remembering the 1995 Day that Madison County, Virginia, was the Center of Too Much Atmospheric Attention. Episode 328, 8/8/16 – Flash Flooding, Featuring “Rain in the Valley” by The Steel Wheels. Episode 338, 10/17/16 – Rainfall Dimensions. Episode 442, 10/15/18 – New River High Water History at Radford, Va. Episode 182, 10/7/13 – Stormwater’s On Your Street. Episode 365, 4/24/17 – Where’s Stormwater Get Started? Ask a Middle Schooler! 3.1, 4.1, 5.1, and 6.1 – Gathering and analyzing data.